Intensify your marketing game by adding an urban touch to your advertising designs. This bundle is all that you need to magnify your Flyers, Posters, & other Advertising Projects. Subways, Parks, Streets, Bus & Train Stations for Your Flyers and Posters! These mock-ups work via Smart Objects. You don't need any skill with Photoshop, just place your design into the Smart Object, and it will automatically update the mockup. Watch the Video Tutorial, see how to Edit a Smart Object in Adobe Photoshop. Designed for any type of Poster, Flyer, Billboard, Roll-Up, Wall-Art, Display. Multiple versions of wall art and posters are included of mostly standard sizes. Huge Image Size for great close-ups: average size around 4200x2800 px 72DPI. These 25 mock-ups comes in PSD format. In just 2 clicks you have your design in a place like you printed it and took a photo of it. The lights, shadows, and reflections are all automatic. You just need to choose the poster and customize your image. A wide variety of different mock-ups, all top quality and realistic. The PSD files are fully Layered with Vignette, Lights, Blur, and some extra elements on the separate well organized layers. Make beautiful close-ups of your designs, and impress your customers and clients with a realistic look of your final product! Some of the photos mock-ups might not be cropped as in the preview images, and contain extra background space. This way you can crop the document to your needs. Instructions and full documentation included, easily place your design into these Mock-ups. Total zip File Size 1.8 Gb - unzipped 2.54 Gb. These mockups are quick to use. Perfect to have a professional result. Instant Digital redemption on the purchase of this artwork made by Alex Cherry. This is a Lifetime Access deal. These advertising poster mockups cannot be re-sold or re-distributed. 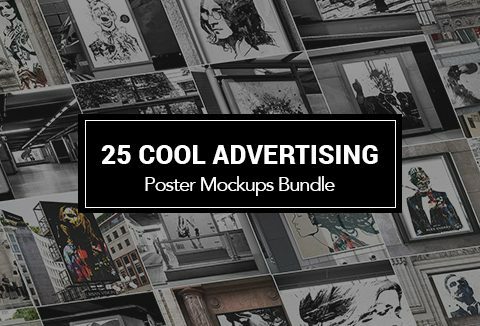 Electrify your product marketing with these urban advertising poster mockups. DealClub Member??? Grab This Deal For FREE.!!! Amazing Looks mockups! Makes it very easy to showcase client projects! Great value! very cool poster mockups. Easy to edit. Perfect for product marketing!